Here is a wonderful testimony in which Reliable Emergency Vehicles is able to help communities all around the world save lives. 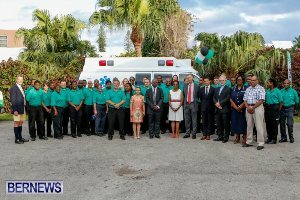 Pictured is the crew at St. Johns celebrating their new ambulance with a ribbon cutting ceremony. "I am sure it will save many lives. I wanted to thank you and your team for getting this wonderful gift to Bermuda which was desperately needed." It was a pleasure working with you. If you are driving in the North Lake Brownwood area and see something bright yellow go by, it is not early spring flowers. North Lake Brownwood citizens have recently received a much needed new ambulance for the North Lake Brownwood Volunteer Fire Department (NLBVFD). On February 7th the new ambulance was delivered by Reliable Emergency Vehicles, Inc. of Comanche to the North Lake Brownwood station. This state-of-the-art unit is a welcome addition to the volunteers who serve North Brownwood County. Features include enhanced safety, patient life support and climate control. The new ambulance has been funded through a State of Texas Governors Emergency Grant and private donations. 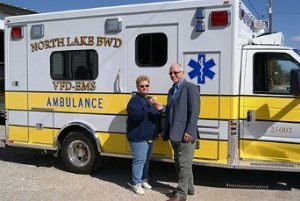 Loretta Bronstein, Ambulance Chief of the NLBWDVFD and Glenn Pratt, President of Reliable Emergency Vehicles, Inc of Comanche, TX were instrumental in bringing this new ambulance to the people of Brown County. The Department covers a 350 square mile area that consists of some very rural, rough terrain. The lake area has been growing and the number of calls to the volunteer service has been growing as well. The residents consist primarily of 1500 residents, many which are elderly. The population often doubles in the summer and on weekends. Reliable Emergency Vehicles, Inc. were awarded sales for 25 new Type 1 ambulances for TACOM to be used in Kuwait. Several years ago both Reliable provided ambulances when the US forces first invaded Kuwait. The ambulances held up very well in some of the roughest conditions known to man. These vehicles will have extra insulation and feature seamless all welded construction. The military wanted an ambulance which was durable, safe and dependable. Mr. Leo Bazan who has been the long standing EMS director at Benevides Texas selects Reliable Emergency Vehicles, Inc. for another ambulance to their existing fleet. This very nice ambulance features 72" ceiling to floor interior, high output vented air-conditioner/heater in the ceiling with adjustable registers. 20 year modular body warranty designed for low cost remounting. All welded construction with side impact beams and a center roll bar for safety. 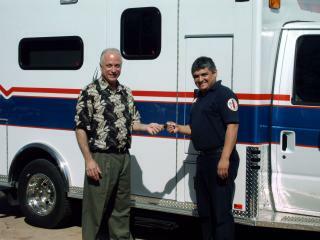 Laredo, TX, April 2, 2005: Jerry Arizola, President and founder of All American Ambulance in Laredo, Texas, joined forces with Glenn Pratt, President of Reliable Emergency Vehicles, Inc. in Comanche, TX after the accident that totaled an ambulance with the Laredo Fire Department. Jerry Arizola of All American Ambulance chose to be pro-active in the wake of the accident that totaled an ambulance, and has placed in his fleet a new 2005 Type 3 Ford 164 Ambulance E450. This unit was elected to fabricate all aluminum module ambulances different from 95% of the ambulance builders. The decision was to utilize thicker aluminum, weld 100% of the body (versus adhesive) and include center roll bars and side impact beams on all module ambulances. 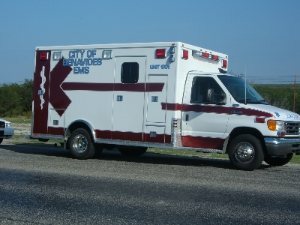 While the Laredo Morning Times reported replacing the totaled ambulance would be approximately $135,000.00, the new ambulance from Reliable Emergency Vehicles, Inc. was only $126,000.00. The new ambulance also includes air bags, which was not available for protection in the front of the ambulance involved in the accident. Another huge difference, in the totaled ambulance, the area the patient rides in was not 100% welded together and there were no side impact beams to help protect in such an accident if the impact had incurred at the side of the box, rather than the chassis. Jerry Arizola realizes that their priority is taking care of their patients and professional crew.and that means safety and top of the line care for all involved. 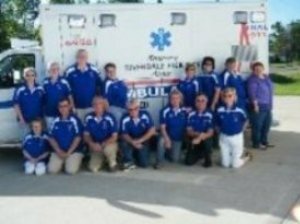 Riverdale Ambulance Service was ready to close their doors until a few concerned citizens realized how crucial an ambulance service is to their small community. After receiving some funding they contacted us to help them find the right ambulance for their specific needs. We were able to recommend this exceptional Unit which not only satisfied their specific needs, but fit into their budget as well. We worked together and they made the purchase. Riverdale Ambulance Service went from almost closing their doors to being extremely busy. They have had a tremendous impact on their community and the surrounding areas. So much so that they are getting calls from EMT’s who want to come and be a part of what’s going on. The word is out and they have plans in the very near future to expand to surrounding communities. They are looking to purchasing another ambulance from Reliable Emergency Vehicles. We are pleased to have this ongoing relationship which allows us to be a valuable resource that helps emergency services provide the best emergency care for their citizens. When US forces in Iraq needed a dependable strong and safe ambulance they turned to Reliable Emergency Vehicles Inc. for their ambulances. Each ambulance features 100% operation on either chassis power or Onan generator power. The module body is seamless and 100% welded throughout using monolithic technology. 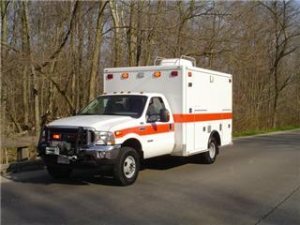 The ambulance features a center roll bar and side impact beams for occupant safety.